INTRODUCTION: Michael Mendelson left the former Soviet Union for the U.S. in 1991. He is a physician specializing in nephrology and works in the kidney transplant unit of the University of California San Francisco Medical Center. Frank Kurtz grew up in San Francisco and has pursued a career in information systems user applications, currently as a database administrator at the San Francisco Conservatory of Music. Both are members of Congregation B'nai Emunah, a small Conservative synagogue in San Francisco. 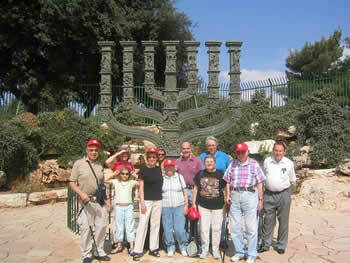 In October 2004 they joined a group from the Congregation on a 10-day visit to Israel. Mendelson was seeing Israel for the first time; for Kurtz, who has a large extended family in Israel, this was his eighth trip. This is an interwoven picture of their experiences and impressions. Kurtz: When a Jew travels to Israel, he or she is not just a tourist seeking pleasant diversion or travel adventure. We seek out Israel as a travel destination because it offers us something that exists nowhere else. If we are mindful, we open ourselves to the full dimension of the experience; if we are lucky, those experiences will come to us so that the connection is made. An old Zionist song says "banu livnot ulehibanot", we came to build and be built. Through a modest amount of seeking we find pieces of ourselves in Israel, and we are touched by them and our lives are changed. Mendelson: My excitement from my trip to Israel hasn't left me! I had never been there and only heard opinions about that country. I had wanted to go for a long time, and now the synagogue I attend regularly decided to organize a trip. When again would I have the chance to take a trip to Israel in such company headed by my rabbi! Kurtz: This was the eighth time I had been to Israel. The first time was in 1960, visiting family with my father. We traveled by ship, 10 days from New York in each direction. Even though I was a very unsophisticated 15-year old, I felt the pioneer spirit and energy in the face of many adversities. Our seventh trip was in September 2003, again to visit family. The deprivations of the early years were gone, replaced with traffic jams and shopping malls; yet, even with the loss of the pioneering ethos, I found that the essence of Israel was still there, and it spoke to me. Being there still felt compelling in an indescribable way. Seeing the absence of visitors, I knew that I should help organize a group trip when I returned to San Francisco. Mendelson: We are flying to Israel, a group from our synagogue with Rabbi Ted Alexander and his wife. We all have known each other for several years. The flight schedule is long, and we gathered at the San Francisco airport at dawn. The flight to Toronto lasted more than four hours. After landing there and passing Canadian customs, we made our way to the boarding area for the flight to Israel, where 25 young Hasidim were dancing around in a circle, holding each other by the shoulders. It seemed a lot like a warm-up of sorts. Our jump from Toronto to Israel took a very long time, more than 12 hours. An entire night passed on the flight, having gone through various time zones before we were above the Mediterranean Sea. We had almost no time to adapt to the difference between the west coast of America and Israel, with San Francisco 10 hours behind. I remember reading Mark Twain's description of his voyage by ship to the Holy Land. Then, 135 years ago, sailing across the ocean took many tedious days. After arriving in Beirut, the group of eight went by horse with mules and tents to the Lake Tiberius, now called Kinneret (in Hebrew), and also known as the Sea of Galilee. In the course of a month, wrote Twain, we expect to arrive in Jaffa. So if someone complains about a long trip, flying to Tel Aviv in 12 hours cannot be compared to sitting in a saddle on a horse over many weeks. Finally, the Air Canada plane landed smoothly and we were ushered into the huge customs hall. The arrival formalities passed quickly. We were greeted there by Kalman Goldner, a professional tour guide of the first order. During our 10 days together; he would open up different aspects of Israel for us and share his passion for the country where he was born, where his parents lived, and where he now lives with his whole family. Kurtz: The thirteen intrepid travelers from Congregation B'nai Emunah knew what the trip was about: to be present in Israel and learn as Jews  specifically as Conservative Jews. With two rabbis in our midst (Rabbi Alexander and Rabbi Cyndie Culpeper), we would certainly be encouraged to maintain our focus. We were the last from among the full planeload of passengers to leave the arrival hall at Ben Gurion Airport because we gathered in a circle to recite the blessing for arriving in Eretz Yisrael. Mendelson: Our tour began with old Jerusalem, the meeting place of various religions, crowded together as in a communal flat back in Russia. Here various cultures and faiths coexist for the most part, but the desire of one of them to be in charge does not meet with the approval of the others. Here is the center of much of Western history -- the Holy Land. After walking through the ancient Roman street, the Cardo, in the Jewish Quarter, we went out to a large open plaza in front of the Western Wall. I became transfixed, and my heart almost stopped beating. I got the jitters. Not losing touch, I looked at the Wall. At the time there were very few people there, and I immediately found a place. I don't know why, but I raised my hands and said the names of my parents and my children to myself. I didn't ask for anything. I only addressed the Almighty. Then I noticed that the Wall, due to all the hands that were raised against it, had become darkened, and in all the crevices between the stones, people placed pieces of paper with their prayers. I remained under the spell of this holy place at the Wall for a long time. The first day concluded with a walk along the Via Dolorosa to the Church of the Holy Sepulchre, the renowned Golgotha. I listened and looked attentively, but it didn't affect me. I was preoccupied by something else. For so many years, my experience of Christian culture involved nothing other than large churches in Moscow and neighboring areas. In America, I became imbued with different values, and Israel was opening new possibilities for me. The next day was dedicated to the new city of Jerusalem. We were taken to the Knesset, opposite which stands a bronze menorah. This work of art contains depictions of various scenes throughout the history of the Jewish People. The inscription on the menorah says that the menorah is the symbol of light, faith and hope that led the Jewish People during 4,000 years through suffering, in its mission to preserve faith in justice and equality among peoples and nations. It is the coat of arms of the State of Israel, and I was proud to stand in front of the menorah to pose for pictures with the rest of our group. We went further on our journey. We came to the Yad Vashem complex. The name of the museum was borrowed from the Bible: "Memory and a name are left remaining in deeds of humanity." Our first stop was the monument to the one and one-half million children who were murdered in the Shoah. It consists of columns with chopped off tops symbolizing the cutting short of life. One million two hundred thousand names are already known. Above the entrance to the Children's Hall is a quotation from the Talmud: "The human soul is the candle of God." Only one candle inside this exhibition is reflected by hundreds of mirrors, creating an unforgettable impression. We walk along a long dark corridor. On the left candles are flickering and the names of the children who perished are heard. We learned that one would have to wait more than 24 months in order to hear the name of the same child again. What a terrifying martyrology! Kurtz: Visiting the memorials and museum of Yad Vashem is a sobering and touching experience. On the top floor of the museum is a non-descript room with several computers connected to the research database. Being an efficient museum browser, I found that I had some time, so I went in on a whim and  for no apparent reason that I can determine  I entered the name of my mother's mother. It took a couple of tries before I found her, since there was some difference between her proper name and the one she used. Suddenly, there was her name in front of me with the information that she had been deported from her home in Hamburg to the ghetto in Lodz, where she died. Although this was not entirely new information to me, I was overwhelmed by the evidence written on the screen and the enormous cruelty of her fate, and I broke down. This was, after all, my grandmother who was taken from me before I was born, who was murdered only because she was a Jew. The kindly gentleman who runs that operation (His nametag identified him as a rabbi, but I was in no condition to remember his name.) saw what was going on and verified her deportation from a roster of the Lodz ghetto. He copied the documents from the search and assembled a packet to take home on which I would provide more particulars of her life along with a photo. Thus she would become a real person in memory rather than a name on a list compiled by Nazis. She had, the rabbi explained to me, been waiting for my arrival for 55 years; he was unfazed by my emotional state. I walked outside tearfully with my envelope. As I gradually regained some composure, I realized that I had been the only person in Israel to mourn for her (my mother could never deal with the loss) and thereby found another piece of myself there. Mendelson: On our last day in Jerusalem, we returned to the Wall in order to walk though the archeological excavations of the Hasmonean Tunnel. After a short descent, we came out to the Wall's foundation column. It was 15 meters high. Another 7 meters of it was concealed below the earth. Here the vividly illuminated giant stone was especially visible. The wall was built of huge blocks of stone without cement, with the stones fitted very precisely into one another. This majestic tunnel still stands before my eyes! Later that day, under the leadership of our rabbi, we visited the nearby Fuchsberg Center, an institute devoted to training American rabbis in the Conservative movement. Just after our visit, the newly-built expanded complex, consisting of a new synagogue, classrooms and administrative facilities, had its grand opening. After being greeted warmly by its director, we spent the afternoon in classrooms, where we shared in a lesson on the weekly Torah portion with the regular students of the yeshiva. The next day we left Jerusalem to head north, bypassing Haifa, and stopping at Akko, an ancient city captured by Alexander the Great, Julius Caesar and Saladin's army. Almost the entire Jewish population of Akko was killed during the Judean Wars by the Romans. The city's name was changed six times after its capture by different armies, including Crusaders, Muslims and others. It was here that Richard the Lionheart built a spectacular hall for special ceremonies, which we were shown. Marco Polo and Maimonides visited Akko as well. The current city has an old fortress in good condition. Today, Jews and Arabs live side by side in the city. We went to Safed (Tzfat) through the Galilee. The small attractive hotel rooms were in small houses on the mountain slope. The view from our balcony was unobstructed and spectacular. It included Mount Meron with its special silence which reminded me of the approach of Shabbat. Our group gathered to walk to a synagogue service. We attended Friday night services at an Orthodox synagogue. Women in our group were ushered into the women's section to pray separately from the men. Inside the synagogue, there was a raised pulpit, and seating at chairs and reading tables. The service lasted about an hour. All the synagogues in the immediate area were full. Everywhere, I saw men in black. They were strolling home slowly with their children of different ages-from the smallest to teenagers of high school age. The next morning we left our hotel headed for a Conservative synagogue in another part of town. The interior of this synagogue was very different from the Orthodox shul. There were big windows and good light. A young man who reminded me of people very familiar to me was sitting very close to the Bima with an open prayer book who then conducted the Shabbat service. Soon I realized why he seemed familiar: he came to Israel as a boy with his parents from Leningrad. This young man graduated recently from the Technion in Haifa and was about to enter the army. After services, the members of the congregation and their president held a reception in our honor. We all said a few words about ourselves. I found out that many of the congregants were professionals and academics. That may explain why I felt so comfortable among these people. Kurtz: Our Shabbat was spent in Safed, a small city that plays a major role in Jewish history. Here, high in the hills of the Galil, the quiet of Shabbat is real and pervasive and is observed by everyone is a variety of ways. On Friday night we went to the Ha-Ari synagogue, an old Ashkenazi center. Our women were out of sight in a mostly closed balcony room. We men sat at desks for the very traditional service. Though I would never consider attending such a shul at home, I surprised myself by how much I enjoyed being there and being able to join in using my own American synagogue skills. The next morning we made our way through the streets of Safed to the Masorti Congregation Shalva. Here we were in a community that had much in common with us. Our Oneg Shabbat lasted well into the afternoon as we all told our stories and felt very much at home. Mendelson: Safed is one of four of the oldest Jewish cities, thanks to its significance in Jewish philosophy and mysticism. Many philosophers and Torah scholars fleeing the center of the country sought refuge here. Safed eventually became the world center of Kabbalah during the early 16th century, when some of the most famous Kabbalists, including Joseph Caro, lived here. We visited Caro's famous Sephardic synagogue, which was established 500 years ago, on Sunday morning before heading south. We traveled southward through the Judean Desert along the Dead Sea, with Jordan on the left and rocky limestone mountains on the right. The lunar landscape brought the primordial world to the windows of our minibus. People come to the Dead Sea for treatment of all sorts of diseases, but, chiefly and successfully, for psoriasis and arthritis. As soon as it gets light each morning, people trudge down to the sea. I watched this process unfolding from the window of my room. This is one of the favorite places for relaxation in Israel. Two days later we were in Tel Aviv, where we visited the Israel Independence Hall, located in a two-story building on Rothschild Boulevard, a narrow street. There, David Ben Gurion proclaimed the Declaration of Independence of the State of Israel on May 14, 1948. The hall is very small and unimposing. Many times, I caught myself comparing Israel with the Soviet Union and the United States, forgetting that this country was born under our eyes. It wasn't concerned with pomp and ceremony, but rather with how to survive in a hostile environment. Our museum guide was a young man, in whom the blood and temperament of the Jews of Morocco, Turkey and several other countries are united. He was passionate about the establishment of his country, and he emphasized to us that Israel enables Jews to live in a country that they built and where they are masters of their destiny. During our stay in Tel Aviv I walked around the city with great joy; it is so unlike other cities in Europe and America. Its buildings are mostly 2 and 3 story houses built long ago, some of which are being torn down and replaced by modern buildings of considerable height. Tel Aviv began as an extension of Yafo (Jaffa) in 1909, along the railway line to Jerusalem. Within 3 years after its founding, Tel Aviv had all of 800 residents, 60% of whom spoke Russian. In 1921, it separated from Yafo and became a city in its own right. In 1931, Tel Aviv had a population of 46,000. During World War II, thousands of Jewish refugees were saved by the city. After the establishment of Israel, Tel Aviv became the cultural and commercial center of the country. From Tel Aviv we visited Haifa, where the topography reminded me of San Francisco. I visited friends who have lived in Haifa for 15 years. They are retired and live in a modest apartment. Their daughter and her husband, both experienced specialists in their fields, are periodically unemployed. Those are stressful times. Their granddaughter recently returned after a two-year stint in the army and immediately began her studies at the Technion. Her sister just finished high school, and it seems that she will follow in her sister's footsteps. They live close to my friends, who play an important part in their lives. The grandmother, an experienced teacher and the former director of a special school in Moscow, isn't idle and gives English lessons from her home. They have grown old, but their life in Israel brings them joy, secure in their future and not reliving their past. I noticed how involved they are in the politics of the country and how they want to be useful not only to their family but to society as a whole. While in Israel, one gradually senses that this is a great country that grew and developed in a short time, slightly more than 50 years. Kurtz: Within our group the discussions were energetic and meaningful. There was much to share in the way of opinions and information. Those seeing Israel for the first time had to be given explanations and perspective. Those vatikim who had been there before had to expand their own sensibilities. As we experienced the kesher, the connectedness that comes from being a Jew in Israel, we discussed how 70% of American Jews could NEVER visit Israel and how this impacts their ability to grow into a full Jewish identity. Knowing many young people who got to Israel through the Birthright program and how much it meant to them, I am impelled to think about providing encouragement and opportunities to bring everyone to Israel for the kind of visit we had. First we would have to open their hearts and minds to the necessity for such a visit, and then we would have to provide the structure to make the visit possible economically for most people who wish to do so. Our Congregation was a very appropriate platform for planning and implementing this trip, but we are a small community with limited resources. If there is ever to be another trip, we would need another intrepid and committed group of people who could undertake the planning and follow through on those plans. Mendelson: Our trip was very rich and rewarding, and I understood the reason for the enthusiastic praise about Israel from people who came here and returned again and again. Energetic people gathered together in this country, acting for their own benefit and for the welfare of the entire country. They gave their lives for her, remembering the suffering of their forbearers living in foreign lands, not their own. They wanted to be free. They were strong, willful, and very industrious, with healthy ideals. I saw how happy they are, from their very souls, and how they understand that enemies and ill-wishers are very close by. The country has grown, thanks to the influx of Jews from the former Soviet Union, from Africa and other countries. I saw a few former countrymen. They spoke very little about their feelings, but they were filled with pride. I met a few of the Israelis who have lived here for several generations. I understand that there are difficult problems among the population, but their pride and happiness came through immediately. I didn't foresee that I would witness this and that I would take such pride in this country and its people. During the many years I lived in the Soviet Union, my Jewish identity was obvious from my last name. It was something that I thought about mainly in relation to the problems it caused me. Being Jewish was a kind of disability, like a missing limb or poor eyesight. My career in medicine was hindered in many ways, and what I achieved was DESPITE being Jewish. I accepted much of this because I did not understand how my life could be any different. When I moved to San Francisco in 1992 I was drawn to organized Jewish life after meeting Rabbi Ted Alexander, who became my teacher and mentor. I saw Jews living openly and in a positive way, and as I gained knowledge and familiarity with Judaism I became proud of my heritage and Jewish observance. After experiencing Israel on this trip, I feel that my personal transformation as a Jew is now complete. My Jewish identity is now defined by being part of a very special people who have accomplished miracles despite the most profound obstacles. I am determined to continue on the path of Jewish learning to enrich my life, and I am looking forward to my next visit to Israel so that I can appreciate more of what this extraordinary country has to offer. Kurtz: So why don't American Jews visit Israel? Those who discount the importance of visiting Israel should consider what it means to be a Jew in the world with and without Israel. Anyone older than the State of Israel has vivid memories of how Jews were dealt with in that earlier time, being at the whim of any malevolent force that might commit abuses on Jews for any convenient reason. Safety and security often meant having to hide one's Jewishness or to be Jewish in a negative, self-destructive way. Ultimately, this state of affairs led to the death of one out of every three Jews in the world. What difference has Israel made? Well, for one thing, the number of Jewish children born in Israel during the 55 years of its existence now equals the number of children lost in the Shoah. For another, having a strong military in Israel sends our enemies around the bend, but for all their ranting and dissembling they cannot change that reality while they realize they cannot attack Jews with impunity. In Tel Aviv there is a major building boom underway constructing apartment buildings by the hundreds, and many of these apartments are being purchased by Jews from France (we met a group of them in Jaffa). France may be beyond the point of no return in coping with its millions of disaffected Muslims, but the Jews know that they have a safe refuge. Thus it is in our own best interests to become closer to Israel through personal means as well as financial and political support. May there be many tour groups like ours visiting in the years ahead, and may they find as much meaning and pleasure in their connection with Israel as we did.